When it comes to your kitchen design, we believe that every detail matters, regardless of its size. 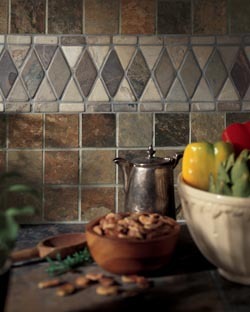 Accentuate your space with elegant tile backsplashes in Anderson, SC, from Harris Flooring America. If you want to add a beautiful accent to your existing kitchen décor, choose our durable, stunning kitchen backsplashes. Offering a unique look and remarkable ease of cleaning, our materials are sure to make an excellent addition to your cooking space. Made from marble, stone, and other materials, our custom tile backsplashes serve as an extension of your countertops and can be used to complement your interior design. Equally attractive and functional, they protect the walls from cooking messes and moisture all the while highlighting a typically forgotten kitchen with a tasteful splash of color and design. Whether you prefer stone or mosaic tile backsplashes, no matter what kind you need for your cooking space, you’re sure to find a perfect home addition when you visit our expansive showroom. In addition to selling an impressive selection of kitchen backsplashes, our skilled crew also performs backsplash installation to ensure every inch of your new wall tiling is placed perfectly. Backsplashes play a prominent role in most kitchens, serving as a vertical extension of your countertop design. Your kitchen walls, specifically those near your cooktop surfaces or sink, are areas that are a prime location for food stains and water damage. By installing kitchen backsplashes, you’re taking steps to protect your walls from oil splatters and water damage and adding to the value of your home. Regardless of which material you choose, you can rest assured that our team will treat your tile backsplashes with the utmost care. Let your imagination be your guide as our exceptional installation team provides your space with an excellent kitchen enhancement. Our commitment to our customers doesn’t stop after they’ve made a selection. Once you’re completely satisfied with your selection, our dedicated installation crew will your new kitchen addition is laid perfectly in place. We’ll handle every aspect of your installation from start to finish, so you don’t have to worry. From measuring and cutting to the final cleanup, we’ve got your every need covered. Contact us today for more information about our custom kitchen backsplashes. We proudly offer our services to customers in Anderson, Seneca, Greenville, Clemson, and Easley, South Carolina, as well as the surrounding areas.